Kicksite is a martial arts school management software designed to help users streamline management workflows and engage students. Users can manage their martial arts school with attendance tracking, tuition collection, communication management, lead management, rank promotion, and social media management tools. Kicksite also features an activity dashboard and a self-service portal for students. Kicksite enables students to sign in to classes with a simple check-in service. Once signed in, students can immediately view attendance records and any awards received for making attendance a priority. Communication tools such as automated emails, scheduled announcements and reminders ensure students stay connected to school activity outside of class time. Users can also organize daily, weekly or monthly messages using the communications calendar. With Kicksite’s tuition collection functionality, users can record in-house payments, set up recurring invoices and track inventory items. By connecting to Kicksite’s preferred merchant account provider, Solupay, users can process one-time payments, manage recurring billing and store Automated Clearing House (ACH) and credit card information securely. Users can create lead campaigns with custom submission forms, confirmation pages, and follow-up emails to capture and nurture new leads directly from their school’s website. Users can create and track events in order to manage rank promotion after belt testing. Kicksite links with Facebook and Twitter accounts to facilitate social media exposure. From Kicksite’s dashboard, users can monitor critical metrics and view data at-a-glance. The self-service portal allows students to monitor their own progress, access videos and documents, and register for events. Maggie (and ALL staff) have been extremely attentive and professional especially at times when I was not my best self.Integration. Inventory (not sure if it's a user error or lack of education on use) - would like a order list once inventory levels reach a set amount. Email - after reviewing the tutorial, I am able to create more aesthetically pleasing emails, however, going through the time and effort of uploading pics into Flickr is a pain. ATA communication link. Not sure entry of testing results is efficient yet. I will try to use it again after August 26 testing, however, a video tutorial would be nice. I have to submit a Tiger testing, then ask headquarters to hold before shipping certificates, then submit a MAK and Adult testing. I don't see a way to do that at kicksite. Website Dojo communication link. I am getting leads from my website and having to enter them separately into kicksite. I'd like them to communicate. Thank you for your review of Kicksite Ms. Palacios. While it is our focus to achieve all 5 Star Reviews, we are grateful for the opportunity to improve on any, and all, facets of your Kicksite experience. The two areas that have our full IT attention are Point of Sale and further enhancements to communications. We are excited about our plans and eager to roll out functionality to make things even easier for you. Updates are coming! As it pertains to testing submissions and lead capture, we have already shared some additional instruction on how to submit testing results with ease, as well as how to ensure Kicksite is seamlessly, and automatically, integrated with your website provider. Thank you gain Ms. Palacios. We take great pride in providing you the highest customer service and the most effective software. We value your feedback and continue to work tirelessly to keep Kicksite at the top of the Capterra review rankings. Ease of Tuition Collection, Student Management, Communication w/Members and Families and Profit Centers/Landing Pages are among the many benefits.My team and I like the ease of use of the program that does just about everything that we need to have done...student tracking, communication, tuition billing/collection, profit centers as well as excellent customer service (not really needed much as the Kicksite team has done a great job and is always innovating). I would highly recommend Kicksite to my fellow martial arts school owners. + Kicksite can track student attendance using a simple, professional check-in system. + Users can capture and nurture leads directly from their website with custom submission forms, confirmation pages, and follow-up emails. + Kicksite supports social media integration, allowing users to create and schedule posts for their Facebook pages and Twitter accounts. + Users can collect and process tuition payments by establishing a connection with Kicksite’s preferred merchant account provider, Solupay. + Kicksite includes communication tools such as automated emails, announcements and reminders, enabling users to engage with students outside of class. Below are some frequently asked questions for Kicksite. Q. What type of pricing plans does Kicksite offer? Q. Who are the typical users of Kicksite? Q. What languages does Kicksite support? Q. Does Kicksite support mobile devices? Q. Does Kicksite offer an API? No, Kicksite does not have an API available. Q. What other apps does Kicksite integrate with? Q. 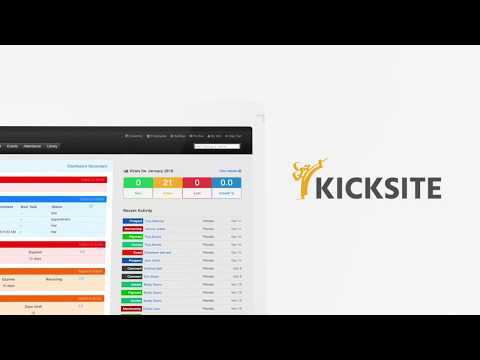 What level of support does Kicksite offer?